Everyone knows the importance of getting surge protection to protect their flat screen HDTVs, Blu-Ray players, video game consoles, cable boxes, internet modems, and PCs. Everybody wants to protect their pricey electronics – especially TVs because we enjoy having them for everyday use. But, what about your HVAC systems? Air conditioning is something we all enjoy and many of us are so dependent on that we cannot live without them. Not only that, but they are an expensive investment, rivaled only by vehicles, college education, and your home itself. So, why risk an expensive repair or replacement? A power surge is a brief spike in voltage traveling into your home. According to the American society of Civil Engineers, power surges and electrical disturbances end up costing homeowners an estimated $79 billion each year. Statistics show that the average home experiences 300 or more potentially damaging electrical surges annually. Surges are caused by a number of things both internal and external in your home such as swimming pool and well pumps, refrigerators and refrigerator motors, dishwashers, washing machines and dryers, and AC condenser motors. 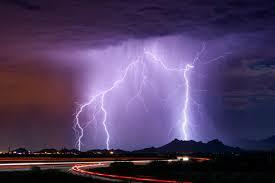 One of the biggest dangers and external causes of power surges are lightning strikes. The state of South Carolina averages over 450,000 cloud-to-ground strikes per year. While direct strikes on homes are rare, lightning has also been shown to be able to travel up to half a mile from where the strike occurs. What kind of damage can a power surge cause your air conditioning system, you might ask? Surges damage the capacitor, which is a small part that serves as a battery to jump start the compressor motor. It takes only a small surge to damage the capacitor, and if left without being repaired, it will eventually kill the compressor because the compressor has to work harder to start up, resulting in a need for replacement. 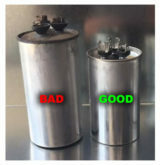 Bad capacitor vs a good one. Note the bulge at the top of the bad one. It is supposed to be flat. There are 3 types of surge protection. There is whole-home protection, which requires a licensed electrician to install, is usually wired straight to the circuit breaker, but only protects from external surges. There are also plug-in surge protectors, commonly referred to as a power strip. Power strips are what you use for your TV, computer, etc. 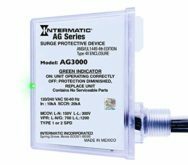 We also offer universal surge protection devices for each piece of equipment on your HVAC system. These devices are small, install quick, and can be placed on ductless systems, mini splits, air handlers, furnaces, heat pumps, condensing units, and boilers. It makes use of a special thermally-protected surge technology to deliver a durable superior performance. Serves as a sort of insurance policy for your investment on your equipment. If you are interested in more information or have questions about surge protection or anything else pertaining to HVAC, please give us a call today at (864)-578-7575!